Screenhaus Design has over 20 years of experience in all aspects of promotional clothing printing. Vinyl printing is particularly suited to short runs and one colour designs. Please use our contact form to submit your quotation or call 01604 714123 to discuss your requirements. This is a single colour vinyl print using Super Flex textile transfer film in gold. The films, or vinyl, are available in a hugh choice of colours and finishes and can be printed on to t-shirts, sweatshirts, hoodies and other garments that are suitable as staff uniforms, company clothing or sportswear. This example is a print on to the back of hoodies. Screenhaus Design will print on to customer supplied clothing wherever possible. This football club name was printed on to the back of supplied tracksuit tops. The alternative of screen printing is really only viable for a minimum quantity of 50 garments (e.g. t-shirts, long sleeved t-shirts, sweatshirts, hoodies, zip hoodies). Screen printing requires drying so only items of clothing that can pass through the dryer can be screenprinted. Vinyl printing is an excellent alternative particularly for customer supplied jackets, tracksuit tops, football shirts, cricket shirts etc. Personalised clothing is ideal for team events, stag or hen parties, or as an individual gift. 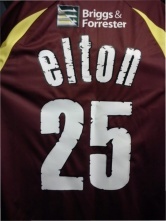 The cricket shirt shown here was presented to Elton John after his performance in Northampton in 2011. Textile transfer films are ideally suited to this type of printing. They are available in a hugh choice of colours and finishes including metallic, fluorescent, and reflective. They provide superior performance and durability wash after wash. This t-shirt uses a combination of vinyl and screen-printing which is ideal for printing individual names. The screen has the tour date details and then each name can be applied individually by vinyl. This type of print is very popular for school leavers, sports tours, stag or hen nights etc. Most forms of promotional clothing can be used for this e.g. hoodies, t-shirts, sweatshirts, polo shirts etc. The customer's bitmap file was converted to a vector file so that vinyl printing could be done in a small quantity for both polo shirts and caps. A bitmap image, also known as a halftone image, is made up of many tiny dots. An example of a bitmap file is a jpeg. A vector image, also known as a continuous tone image, is made up of solid areas within the design. This means that an outline file can be produced and sent to the plotter so that the vinyl can be cut to the required shape. By supplying Screenhaus Design with a vector image file set-up costs can generally be reduced. Examples of vector files are Adobe Illustrator or EPS files. Alternatively Screenhaus Design can convert bitmap to vector files for a small charge. A t hree colour screen print - white, yellow and black, requiring substantial experience and skill from the printer. This type of design also lends itself to being reproduced using high quality heat applied transfers. These type of transfers have a minimum order of 100 but once purchased can be applied to the clothing over a period of time. This is an example of how vinyl can be pressed down on an existing vinyl design so that the clothing can be re-used.